For people struggling with alcoholism, finding an AA meeting can be a lifesaver - literally. Luckily, they are easy to find in most any area of the country. Most AA meetings take place at churches or community centers. Major cities tend to have one or more meetings every single day of the week. You can even find and attend meetings while you are traveling since anyone in recovery is welcome, regardless of where they live. If you've never been to an AA meeting before, don't worry. It's likely you won't be the only newcomer. One of the best resources on the Web for finding an AA meeting is the Betty Ford Center Alumni Services page. Click on your state and look at the right hand column of the new page that opens. Select the link for Alcoholics Anonymous. Next, select the city nearest you. You'll be directed to page with local meeting locations, dates and times. The Alcoholics Anonymous official site provides links to local resources too, but it does not provide as comprehensive of a nationwide meeting list. Dial the national Drug and Alcohol Abuse Hotline at 800-662-HELP and speak to one of the counselors, who can help you find a meeting anywhere in the country. You will not be required to leave any contact information. To find your local AA hotline number, which will direct you to meetings in your region only, use the online resources above or check for a listing in your phonebook under Alcoholics Anonymous. This is a good way to find new meetings that might not have made the online listings yet. 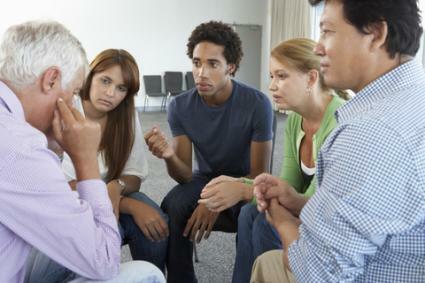 If you are currently in a recovery program, ask your counselor to refer you to a meeting. More than likely, he or she will have a printed list of meetings that you can take with you. Find just one meeting and you can easily find others. Ask the night's facilitator for a "newcomer's packet," which should have a listing of local meetings. If you'd rather not speak up right away, look through the literature on the table in your meeting space. You can also ask another attendee before or after the meeting. It's a good idea to try several meetings in your area before settling on one. Each AA meeting group has a different vibe to it. If you don't like the first meeting you go to, don't give up. Many people attend three or four different meetings before they find one that works best for them. It's also okay to attend more than one meeting a week, or even more than one a day -- whatever you need to do to facilitate your recovery.